My son Arturo became a hippy. He didn’t study, didn’t work, and smoked weed all day long. I prayed the Virgin but she didn’t hear me. 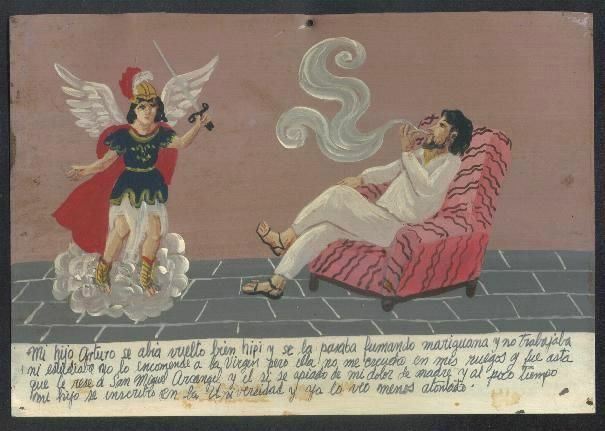 Then I asked Saint Michael the Archangel. He was touched by my sorrow, and some time later my son went to the University. Now he is not as dopey as before. Marina Perez worked in a fish shop, and she came home having a fishy smell. 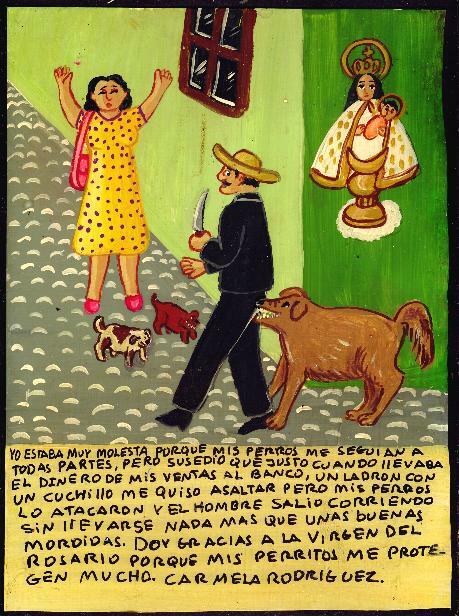 Her husband didn’t want to approach her, and Marina felt offended and sad. Then, with all her savings, she opened a flower shop. So now she smells like roses and jasmine. And her husband even offered her to have a new baby. She thanks Saint Anthony because now she is happy. 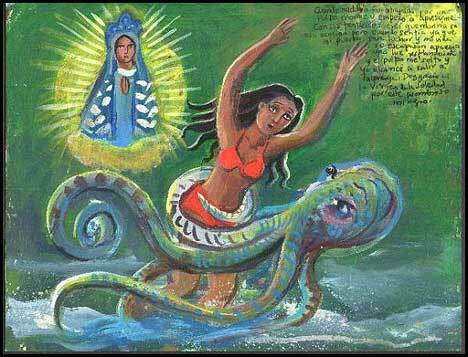 When I was swimming I was attacked by a giant octopus. He chocked me with its tentacles, so I decided I’d gonna die. My strength gave out, I was losing my life, when suddenly the beam of light flashed from nowhere. The octopus let me go and I managed to escape. I swam to the shore. I thank the Virgin of the Solitude for this miracle. December 30, 2004, at the evening, Ernesto Valdes Perez […] had an unpleasant experience with deadly consequences, when he almost died of long exposure to the carbon monoxide. He crawled out to the balcony, following his instinct, and activated the alarm that attracted the help of the Green Cross and the police and later on the morbid presence of the television with helicopters. However, they didn’t find anything serious, nor the victims. Thanks God for this miracle that happened in Monterrey, Nuevo Leon, at the foot of the Saddle Mountain. 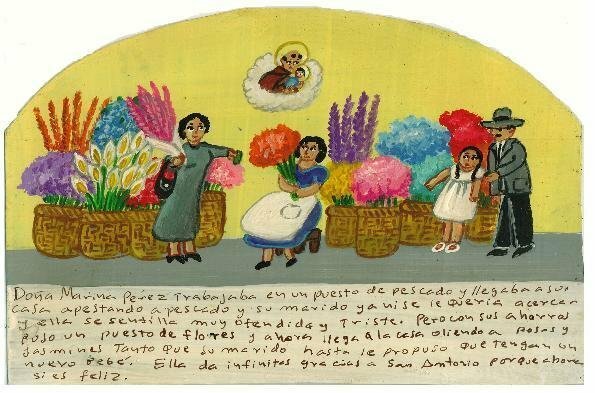 He made this retablo to the Virgin of Guadalupe in gratitude for saving his life. 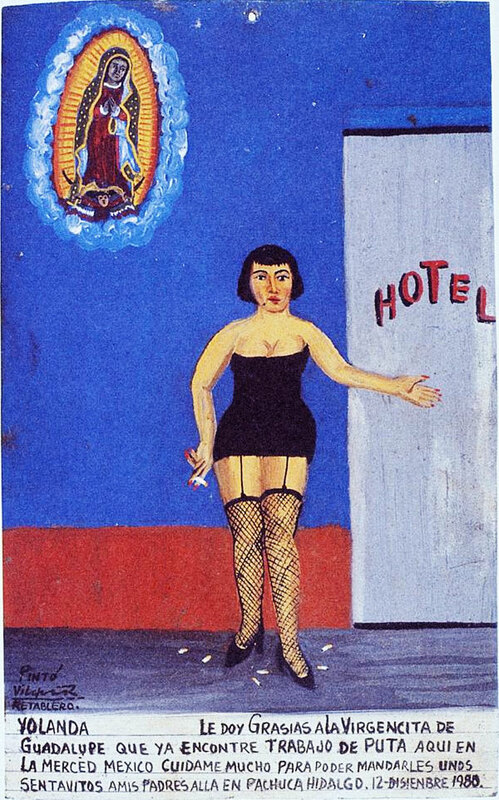 The great Rita Reyes has money and she’s happy to be a prostitute. Thanks to the Virgin. When my family and I came back from our relatives to our village, we discovered that all the inhabitants had been abducted by an UFO. 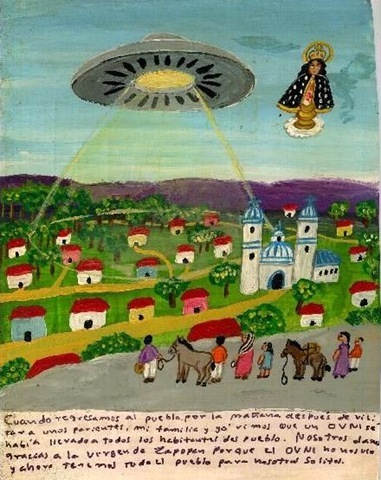 We thank the Virgin of Zapopan because the UFO didn’t notice us, so now we had the entire village in our disposal. 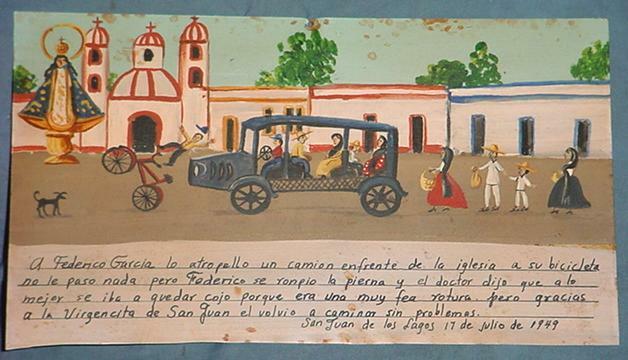 Federico Garcia was hit by a bus while riding a bike near by the church. Nothing happened with the bicycle, but Federico broke his leg. The doctor said that he probably would be limping for the rest of his life, because it was a very nasty fracture. But thanks to the Virgin of San Juan Federico got recovered and now walks without problem. I was very annoyed because my dogs followed me everywhere. But one day I was delivering my shop proceeds to the bank, and a robber with a knife wanted to attack me. My dogs attacked him instead, and he had to ran away, having nothing but some dog bites. I thank the Virgin of the Rosary for my dogs protect me very well. 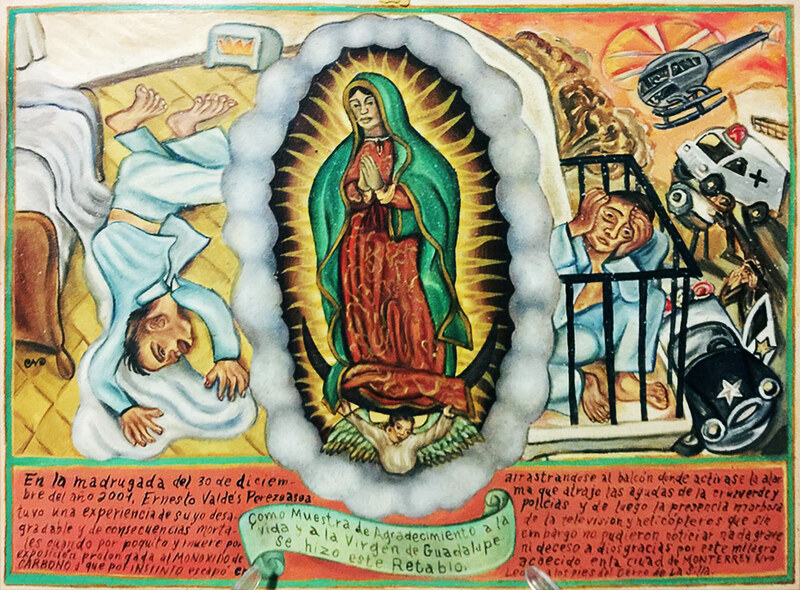 Yolanda gives thanks to the Virgin of Guadalupe for finding a job as a prostitute here, in La Merced, Mexico. Look after me, so I could send some money to my parents in Pachuca, Hidalgo. 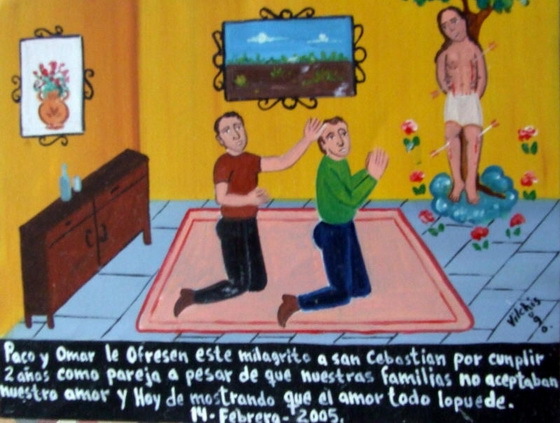 Paco & Omar offer this retablo to Saint Sebastian for their second anniversary of being together, in spite of the fact that our families were against our relationship. It proves that love can do everything. I was coming back home very late. Suddenly I was attacked by a man with a gun. He wanted to rob me. 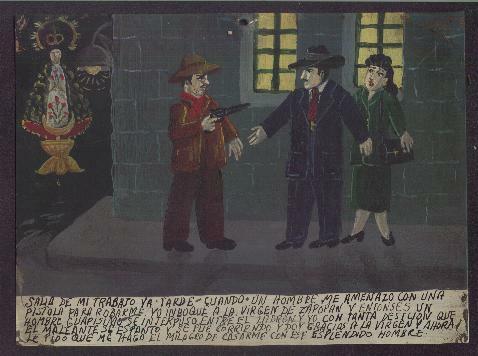 I prayed to the Virgin of Zapopan, and suddenly a very handsome man decidedly blocked the robber’s way. The robber got scared and ran away. And now I ask you, Virgin, please make so this magnificent man would marry me. My son studied to be a dentist, like my husband. But he was very annoyed to look in open mouths, and he felt unhappy. But one day he discovered that his real calling is to be a pastry-cook. He makes amazingly wonderful pastries and cakes. He even opened pastry-shop, and it is very popular. 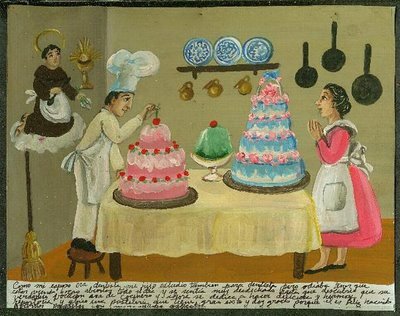 I thank, because he’s happy making such tasty cakes. 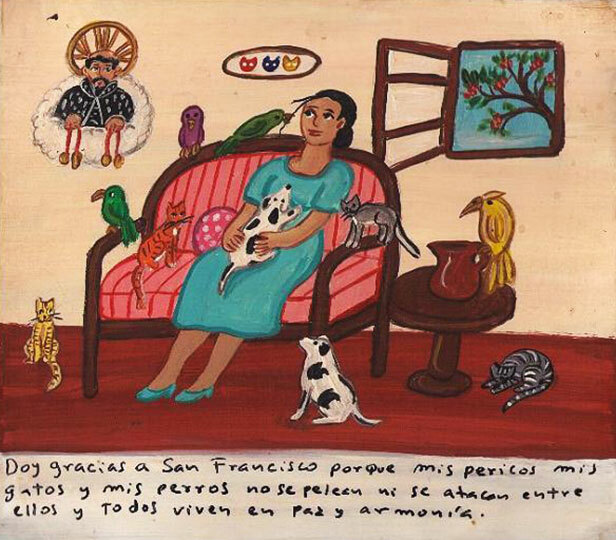 I thank Saint Francis for my parrots, cats and dogs live in harmony and do not fight with each other.